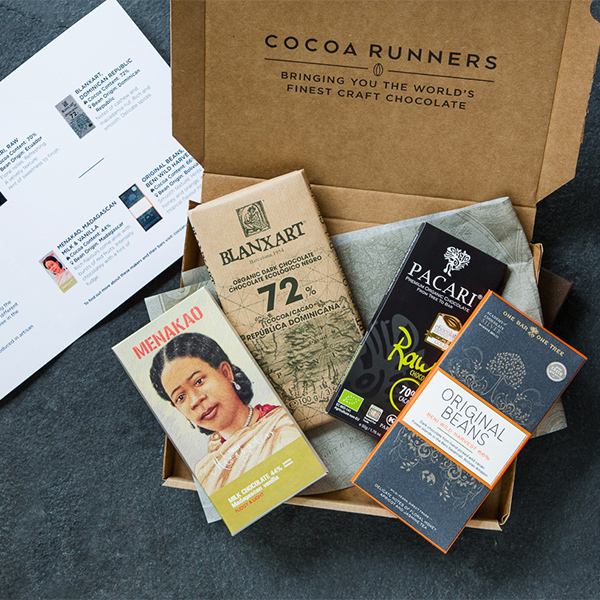 As a member of the Cocoa Runners Tasting Club we’ll send that special someone a box of four carefully selected premium chocolate bars every month in a choice of either milk and dark or exclusively dark bars. With each box we aim to broaden your experiences of chocolate, from exploring single origin beans, to comparing styles and flavour from different parts of the world, to unwrapping the stories behind our artisan makers – they’ll have plenty to look forward to. They’ll also find a letter explaining each bar’s unique history, and pointing out certain flavours to look out for by our team to guide them along the way. What’s more exciting than receiving the finest chocolate from around the world straight to their doorstep?! We hope that you enjoy your chocolate tasting course! In order to activate your membership and start your course, you need to have your personal activation code to hand. You can find this on your gift voucher. Add this product to your basket then enter your personal code in the ‘Promo Code’ box. Double-check your address is correct. Once you place the order we can’t change this! Please note: the price of this gift includes shipping to UK addresses. There will be a small additional charge for the gift to be shipped to international addresses that will be payable when the gift is redeemed.